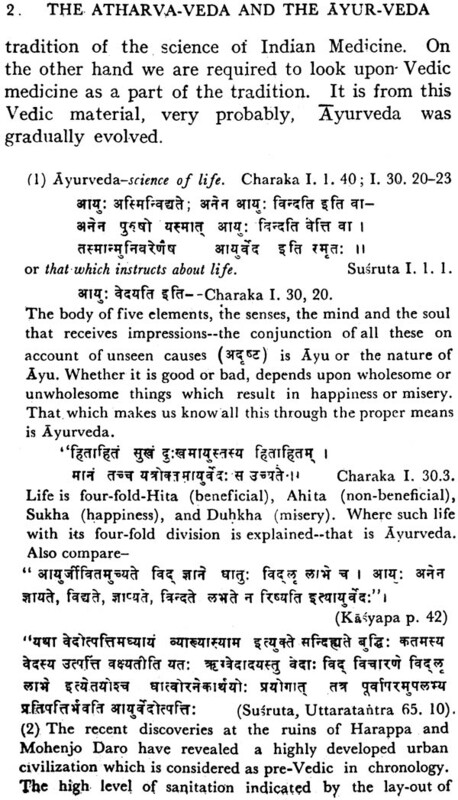 Exegetical discussions wherein the medical charms of the Atharvaveda are explained in the light of the relevant passages from the Samhitas of Caraka, Susruta and Kasyapa. I am glad that at long last this work is being presented to the learned public for critical appreciation. This is my second work on the Atharvaveda. “The Atharvaveda Civilization”, my first work, on the Atharva-veda was published by the Nagpur University in 1959 with the aid received from the University Grants Commission. Now this work is also being published with the aid received from the Nagpur University as well as from the King Edward Memorial Society, Nagpur. I am sincerely thankful to the Vice-chancellor, Nagpur university and the Honorary Secretary K.E.M. Society for their respective contribution towards the publication of the present work. I am particularly happy to have secure d a foreword from Shri R. P. Naik, I.C.S., Joint Secretary, Ministry of Education, Government of India, New Delhi. I am sincerely thankful to him for his interest in my researches. My thanks are also due to Prof. N. L. Rao of the English Department of Nagpur Mahavidyalaya, Nagpur, for going through the proofs and making valuable suggestions. If some one were to ask me what in my opinion, is the highest achievement of the human mind, I would unhesitatingly reply: Its triumph over superstition, its escape from prejudice. It is fascinating story this the march of man through the ages, in his eternal struggle, to wrest the secrets of nature one by one from its unwilling lap. In his learned treatise on the Atharvaveda and the Ayurveda. Dr. Vinayak Waman Karambelkar has taken us to the earliest roots of Ayurveda to be found in the Atharvaveda, thus affording us glimpses of the beginnings of the great Indian medical Tradition. 2. Dr. Winternitz has said that the physician is the direct descendant of the soreerer and the magician. And how could it be otherwise? Surrounded by elemental forces of nature and without the assistance of modern scientific instruments which have enabled man to probe deep into the mysteries of nature. it was natural that he should be a little overawed and appalled by such phenomena as storm and rain, fire and flood on the one hand and disease and death on the other. As if from nowhere nature would at times descend upon him with all its fury and the human body would be afflicted by maladies of strange character. As an explanation, he could not but fall back upon the super-natural and felt that there were unseen malevolent forces at work which had somehow to be appeased if not conquered, with the help of benevolent deities. Further, his experience showed him that some diseases could be cured with the use of certain drugs and herbs and, hence, he came to credit them with some inherent supernatural power. Language also was a strange phenomenon and he considered Word as a manifestation of God; it was an obvious next step to consider certain words as endowed with intrinsic mystic power which could work miracles. 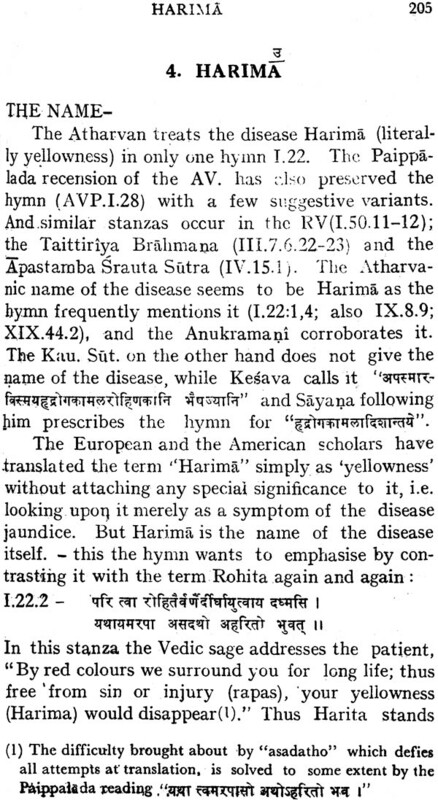 As pointed out by Dr. Karambelkar, the charms of the Atharvaveda seek to establish causal relationship between demons and diseases. More, the Atharvaveda tries to establish that a particular disease or, to go a step further, a disease itself was a demon. Vedic medicine is also rich in spells against poison of all sorts. 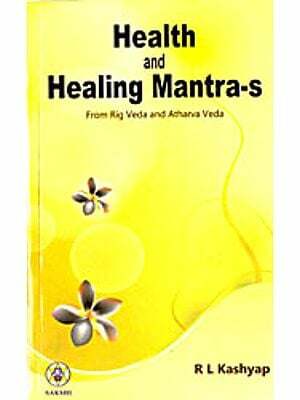 The Atharvaveda represents the charms system of the Ayurveda of the Vedic age. 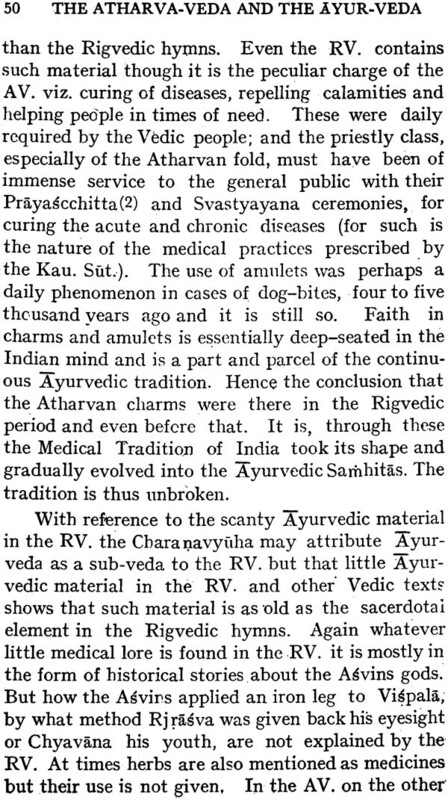 The refrain of the Atharvaveda is “The Charms and amulets are more efficacious than herbs and medicine”. 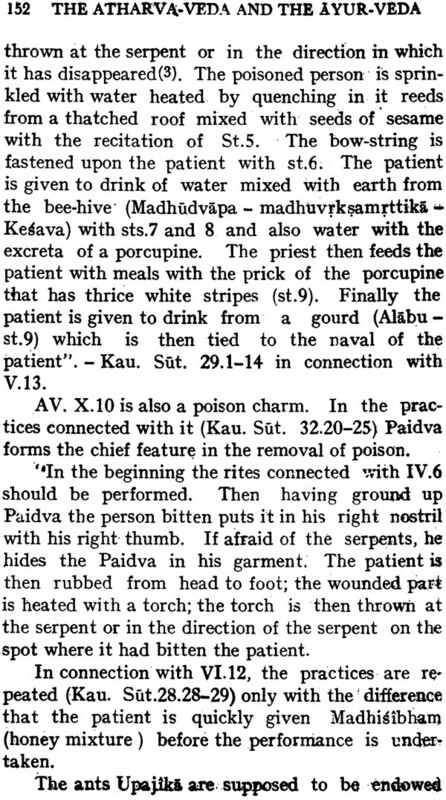 Dr. Karambelkar has brought out the fact that there was a medical tradition of drugs coming down from pre-Vedic times when the Atharvavedic system of charms came into prominence, The Atharva Veda does not represent the sole medical tradition of India for the Kausika Sutra has more knowledge of medicine and medical practice than the Atharvaveda itself, which is must obviously, have derived from other sources. Obviously, the Kausika Sutra effected a compromise of the two systems and thus faith in the efficacy of charms became a regular feature of the Indian medical tradition and the two system came to be amalgamated. 4. The fact, however, remains that the rudiments of Ayurveda are to be found in the Atharvaveda and all the branches of Ayurveda have been dealt with in it. Dr. Karambelkar has dealt with all these aspects in a learned and thorough manner and has given us a critical account of the medical tradition the origin of disease, Atharvan Anatomy, Strikarmani, Medical Practice and Medical Ritual. His treatment of individual diseases is also well done and throws a great deal of light on many obscure points. 5. While his treatment is objective and his approach scientific, I find it difficult to go all the way with him at one or two places; for example, when he says, “Curative effect of Charms is through their sound vibrations which are recognized to be effective by modern science also ….. so we can assert with some confidence that the charms were not simply witchcraft and deception but had scientific basis.” There may be room for a difference of opinion on this point but to my knowledge the claim has not been demonstrably proved yet. It would be possible to accept this only if a causal relationship were established between the two on the basis of scientific observation and experiment under controlled conditions. At best, we may say that we can discern here the germs of the psychosomatic technique of later days. Similarly, when the author identifies germs and worms etc. mentioned in the Atharvaveda, with particular microscopic bacilli and cocci which obviously could never have been seen without a microscope, which was not invented till thousands of years later. 6. The Atharvaveda is by all accounts a curious compendium of medicine in its various stages of evolution and contains the most primitive as well as some of the most highly developed stages of therapy. Throughout, the faith was that while a mere mantra may or may not cure a disease, its was sure to do so when used along with medicine. As I pen these lines, I find a large number of people repairing to a place where a gentleman is staying these days claiming to cure incurable diseases by a word, a touch or a pinch of vibhuti and I see even the blind going to him in the forlorn hope that they might after all get their sight back. Are we really very far from the days of Atharvaveda? I wonder. Perhaps the tradition is too deeply seated; perhaps notwithstanding all his discoveries and inventions man is but a puny creature before the might of Nature; perhaps there are heights, to reach which reason flutters its wings ineffectually and in vain. I don’t know. 7. I have written this foreword with the greatest pleasure and I hope the reader will find the study of this work of Dr. Karambelkar as rewarding as I have done. India is a very vast country stretching over thousands of square miles and possessing every climatic variation possible under the sun. The history of this country too, goes back into the hoary past of six thousand years in which, centuries after centuries rolled by witnessing varied fluctuations in human life. But how much do we know of these fluctuations - especially in the form of diseases current in this land and their traditional cures? We begin with Charaka and Susruta whose treatises contain names of ancient authors on medicine and their opinions on diseases and their remedies. This means the Charaka and Susruta and even Vagbhata were conscious, at least, of their immediate past. 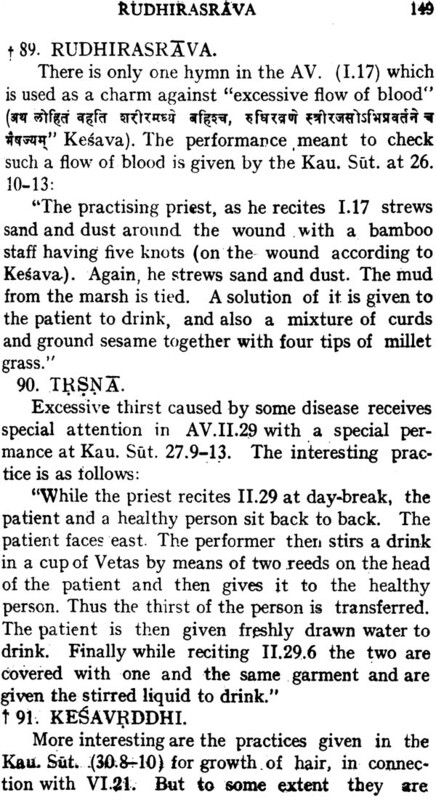 But where is the account of the periods lying prior to and after these two great sages of Indian Medicine? From the Vedas to the Charaka Samhita is a pretty long period- nearly 4000 years, and similarly another long period, nearly 1800 years, separates us from Susruta. What were the activities of the people of this ancient land during these two long periods, activities directed against diseases? Their account is yet to be written. Undoubtedly efforts were made in this direction. 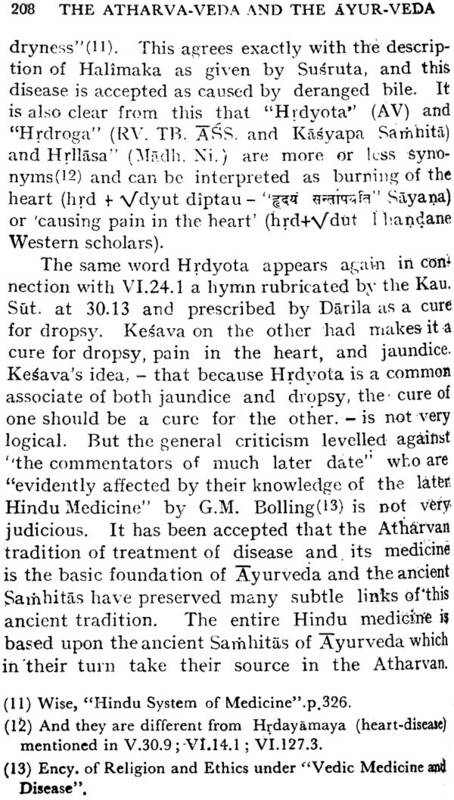 Wilson’s articles on ‘Hindu Medicine” or Royles’ “Essay on the Antiquity of Hindoo Medicine” are good but only as pioneer works. 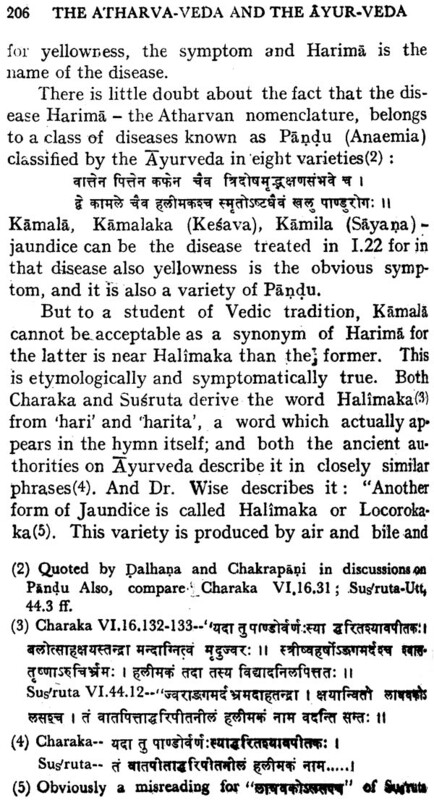 Valuable re Dr. Wise’s “A Commentary on the Hindu System of Medicine” and Dr. Jolly’s “Indian Medicine” as historical expositions of the subject dealt with by Charaka, Susruta and Vagbhata. The translations of the classical works of Charaka and Susruta respectively by Kaviratna and Bhisagratna; the publication of the Bhela Samhita by Calcutta University and of the “Kasyapa- Samhita” by the N.S. Press of Bombay are steps taken in the right direction. But that is not enough. No doubt, there is the “History of Indian Medicine” by G.N. Mukkopadhyaya but it is a work with a difference aim. Real contributions towards the reconstruction of the history of medicine are only a few which made their appearance after long intervals. Among them mention must be made of Dr. Hoernle’s “Studies in Ancient Indian Medicine (Osteology)” and his “Notes on Susruta”. Also his edition of the Bower MS and his discovery of the Buddhist medical MSS in Chinese Turkestan are very valuable. 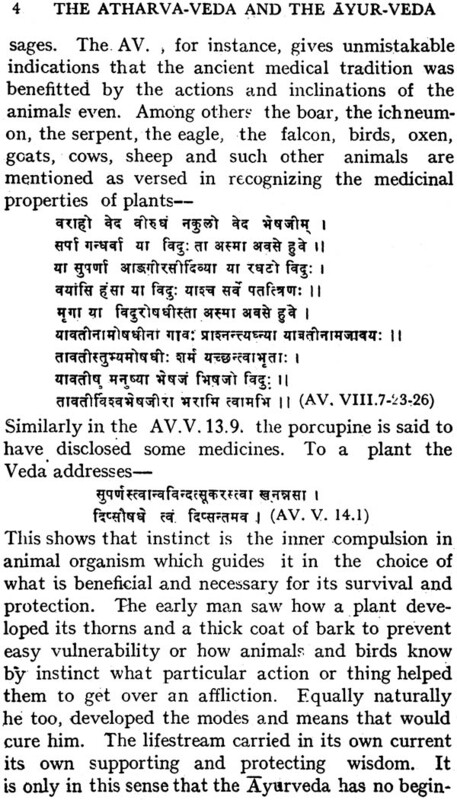 Bolling’s essays on “Vedic Medicine” in the Encyclopaedia of Religion and Ethics and Dr. Dasagupta’s. “ Speculations of the Medical School” in his History of Indian Philosophy are of utmost importance. These contributions towards the reconstruction of the history of Indian Medicine, howsoever valuable they may be are yet too few to afford a complete and exhaustive treatment to a subject which is very ancient and is so very vital to human life of such a vast country as India. It is indeed unfortunate that no solid effort comes within our ken after the few enumerated above. Probably the ‘Doctors’ of this country are not interested in this subject. (1) and the real physicians are, perhaps, unable to undertake it. Time was when in the Western world “History of Medicine” was looked upon as a philologist’s diversion, classical scholar’s pastime and bibliographer’s entertainment. But after 1900 A.C. a change took place. The acknowledged leaders of medical thought and profession in Europe and America began to advocate the necessity for a comprehensive and historical perspective in the study as well as the investigation of the puzzling problems in medicine. Eminent doctors thought it worthwhile to ‘approach a disease’ in ‘Historical spirit’. So in France, Germany and other European countries scholars ransacked libraries, collated MSS and copied them, translated the classics, investigated biographical and bibliographical notes in order to reconstruct the “History of Medicine”. Prof. H. Segerist was the most eminent among them who worked ceaselessly for the cause of the “Historigraphy of Medicine”. It was due to his efforts that separate University chairs were instituted in Europe and America for History of Medicine. The problem of History of Medicine is presented by Prof. Segerist in the from of answers to three questions. What is History of Medicien? What does it want? and how does it work? “The History of Medicine”, he explains, “is first of all history like that of any other subject but with some difference. Secondly, History of Medicine is medicine itself. No modern physician can understand classical authors like Galen or mediaeval writers like Paracelsus unless he has studied the History of Medicine. History of Medicine attempts to ascertain in a scientific manner how the prehistoric man reacted to the unfavourable conditions; what he did to get over his suffering; and what he ancient doctor did to heal the sick man who sought his help. The origin and growth of theories in medicine, the geographical conditions that favoured the spread of diseases the recial differences in susceptibility to infection and the evidence for assuming the existence of various diseases in the past etc. are highly interesting questions requiring the ablest minds and the most patient research. The study of diseases of a certain epoch and of a certain region is the starting point for the investigation in the History of Medicine”. For the reconstruction of the History of Medicine, the first and the foremost preliminary is the study of the sources available. This requires a considerable amount of spade work. It is only after exhaustive investigation that one can fix the sources to be utilized for such study. It is not merely the medical literature that one has to examine but also the MSS of the physicians written centuries ago. In order to understand the thought-forms of these ancient physicians, which are peculiar to the epochs to which they belonged, one is expected to know fully the environments and the philosophy of those periods. Again all sorts of materials- treasures of art, architecture, literature, etc. are to be properly sifted with a view to culling every valuable thread in “the great texture and make up of a multicoloured and complicated mosaic” showing an order, a rhythm. The historian’s eye must always be on every thing that may have any medical significance. The close observation and scrutinizing of the literatures of all epochs in different languages (Sanskrit, Pali, Prakrits etc. 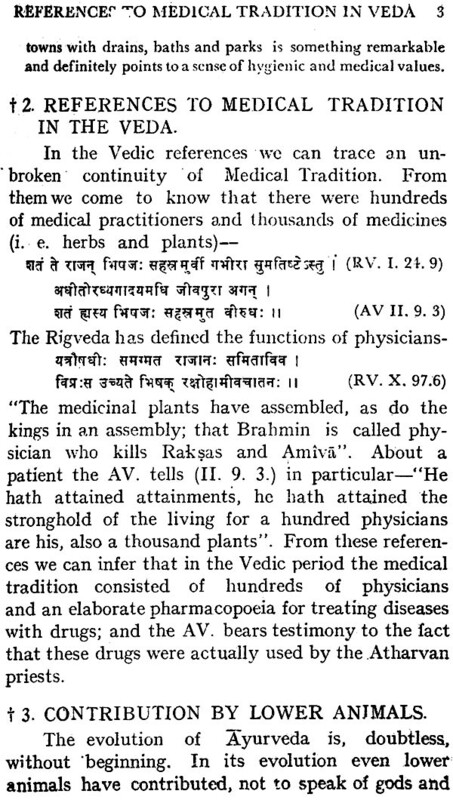 ), the documents of the age-long beliefs such as are the Vedas, associated with particular diseases,- all this is very important to get a complete picture of the theory and practice of medicine in ancient India. All the branches of Indology- Archaelogy, Epigraphy, Numismatics, Philology, Philosophy, Mythology, Vedic studies, studies in the Purana, Tantras, technical works, etc should be marshalled to face the medic-historical problem. All these- the Vedic mantras the Tantric worship, the bas-reliefs at Sanchi, the Buddhist Jataka stories and the canonical works of the Jains are all complementary to one another (2), for we must note that the antiquity of diseases was deduced from the Prehistoric data- Rickets, Achondroplasia and Poliomyelitis were known from Egyptian mummies and Grecian vases; similarly treatment of fever, diabetes, erysipelas, chlorosis, scrofula, epilepsy, muscular atrophy etc., can be traced to the Atharvana medical charms. The magic formulae of the Atharva Veda should, therefore, be regarded as an indisputable link in the ancient Indian Medical Tradition, and even as medicine proper. Charaka states: “He is physician who cures diseases and whatever cures diseases is medicine”(3). Thus if the magic formulae of the A.V. or the medical practices of the Kau. Sut. cured diseases, they are surely medicine. It is well said that medicine is not only what the physician does ; its scope is larger. Such a history at hand will serve as a golden key to the understanding of many of medicine in both academic and practical ways. Prof. Segerist says, “Medicine has to be specialized by necessity but the more specialized it became, the more need was felt for a platform, a watch-tower, from which medicine could be studied as a whole in its development and tendencies and in all its social complications. After such a history is written, the clinicians will gradually begin to take interest in it not out of “cultural and benevolent needs” but also out of needs born in course of their practice of using medicine. 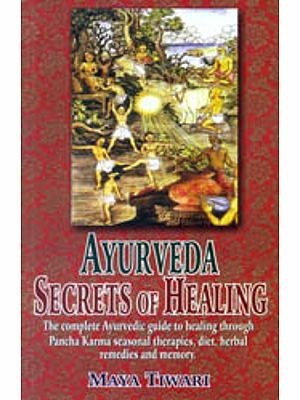 Indian medicine is not synonymous with Ayurveda nor is Ayurveda synonymous with the texts of Charaka and Susruta. The Ayurveda stands for the medical tradition of India which began with the beginning of the Aryan race, continued through the hymns and charms of the Vedas and the literatures of different epochs. This ancient Indian Medical Traditional has passed through successive stages; Charaka and Susruta summarized, perhaps, the high ideals and achievements of this tradition during their respective ages. The study of these authors is useful for the reconstruction of the History of Indian Medicine, but it will be, indeed, a poor history if we do not interpret, the primitive rites, the practices and beliefs of the early people of India as reflected in the Vedas, Brahmanas, Upanishads, Sutras, Buddhist and Jain works, Tree and Serpent cult, the Tantric philosophy, the mediaeval practices contained in the Puranas, dramas, poetry, folk-lore, legends along with the observations made by foreign traveller. Such a history is yet to be prepared, and it is a task for many scholars. To that end, the study of the Atharvan charms and the practices of the Kausika Sutra are to be investigated. (1)	The notable exception to this general observation is that of Dr. D.V.S. Reddi of Vizagapattam who has tried to collect medical information from Sanskrit and Buddhist literary works. His paper on “A Plea for the Promotion of the Study of Medicine in India” in the Journal of the Indian Medical Association (Vol. VII. no. 12. 1938) and that of Dr. 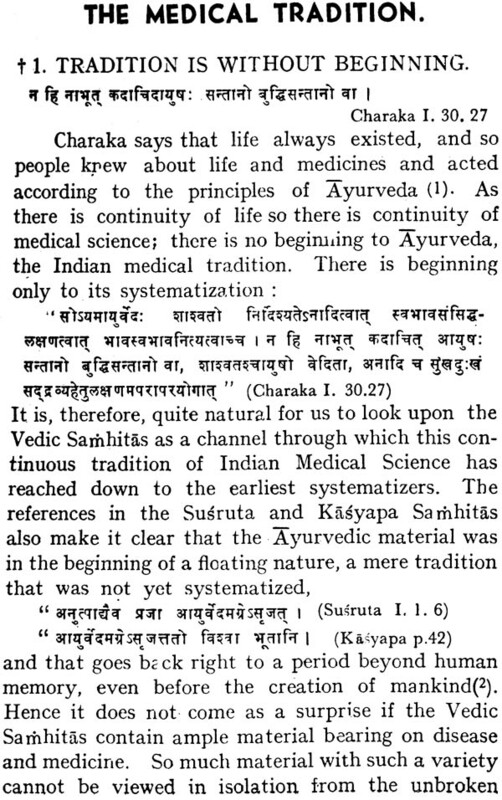 P.M. Mehta on “The History of Indian Medicine in the “Antiseptic” (Oct. and Now. 1956) gave me considerable incentive. (2)	The Amaravati sculpture contains a scene in which a surgeon is shown in action of cutting the flesh from King Sibi. There is also a scene in Nagarjuna Konda sculpture showing an illustration of fainting and collapse. 2. 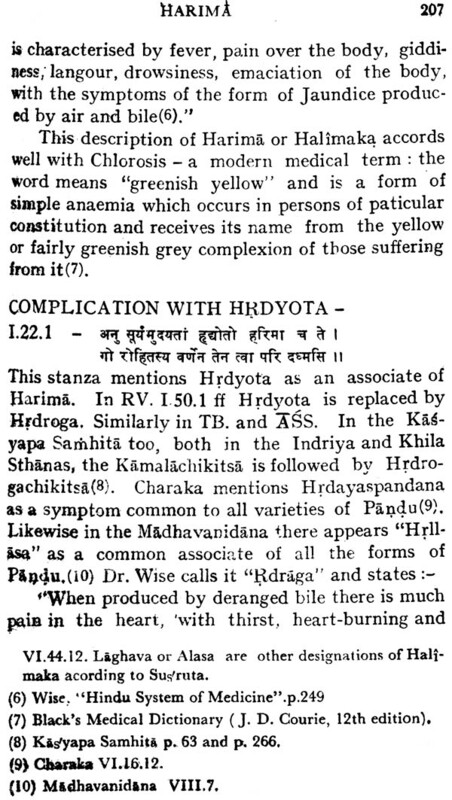 References to the Medical Tradition in the Veda. 3. Contribution by lower animals. 4. Contribution by gods. -Rigveda. 5. Material in Vedic literature. 6. Relation with the Atharva-Veda. 7. Brahma-Prajapati at the head of the Tradition. 8. Prajapati in the AV. 9. Indra in the AV. 10. Sun, Fire and others. 12. The teachers of the Ayurveda. 15. Continuity in Jain scriptures. 16. Tradition summarized in Charaka and Susruta. 19. Salyatantra in the AV. 20. Salakyatantra in the AV. 21. Kayachikitsa in the AV. 22. Bhutavidyaa in the AV. 24. Agada tantra in the AV. 25. Rasayanatantra in the AV. 26. Vajikarana in the AV. 27. Medical Tradition is the reflection of human want. 28. 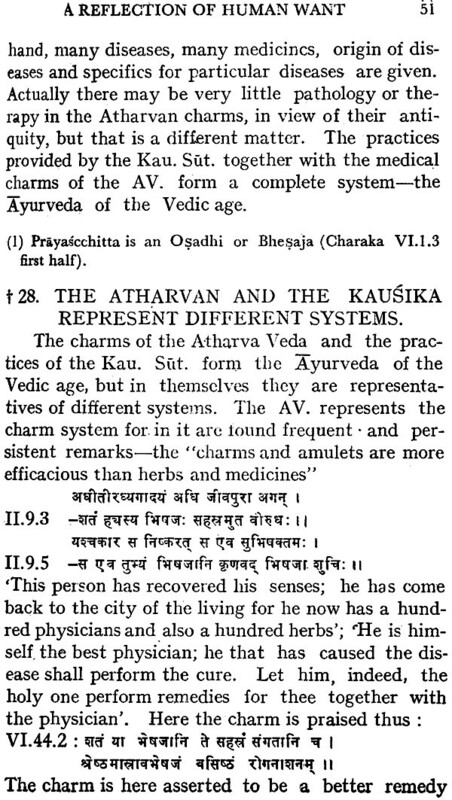 The Atharvan and the Kausika represent different systems. 29. 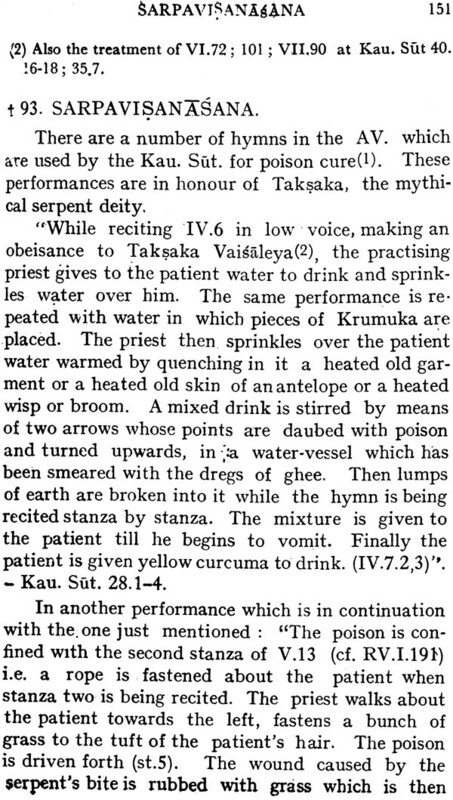 The Kausika Sutra or the Drug System. II. THE ORIGIN OF DISEASE :pp, 61-79. 34. Kalavada of Bhiksu Atreya. 36. Possession by demons and spirits. 37. Germs and worms as causes of disease. 38. Abhichara as the cause of disease. 42. Bones in the AV. 44. The number of bones. 45. Susruta does not belong to a different tradition. 49. Nadi is a general term. 52. Manas and Cchitta - Nervous System. 53. From conception to birth. 57. Birth of a child. 58. After the child - birth. 59. Treatment of disease in the AV. -General. 60. 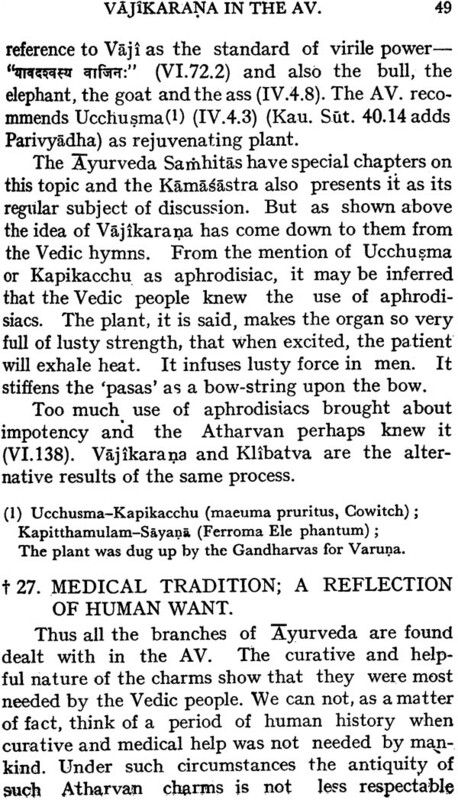 The method of Atharvan treatment - Plants. 62. Medical practices mentioned in the hymns. 65. 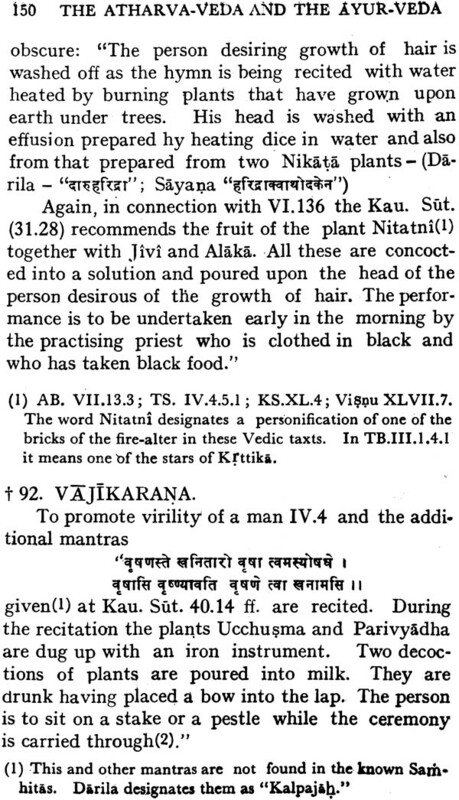 Traditional contribution by the Kausik Sutra - Religious effect. 66. The method of exorcism of the demon of disease. 67. Special Amulets of the Kau. Sut. 68. Additional practices from the Kau. Sut. 69. From the Commentators of the Kau. Sut. 70. 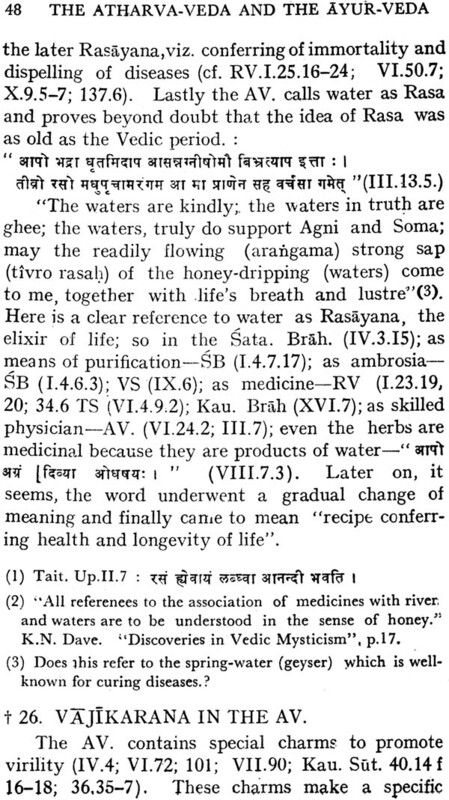 The materia medica of the Atharvan and its literature. weight of book 445 grm.